And then give me your feedback below in the COMMENTS section. 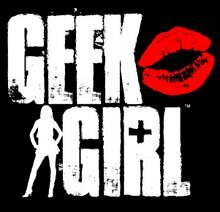 Or, email me your feedback, or even video feedback, at geek.girl@earthlink.net. Say Hello to my Little Friend... 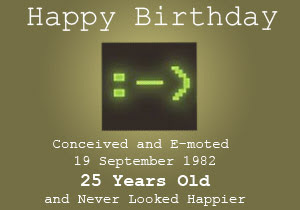 :-)...Happy 25th Birthday, Smiley Face! Click HERE for the Carnegie Mellon University's official smiley page, with details about it's history. It was a serious contribution to the electronic lexicon. :-) Twenty-five years ago, Carnegie Mellon University professor Scott E. Fahlman says, he was the first to use three keystrokes — a colon followed by a hyphen and a parenthesis — as a horizontal "smiley face" in a computer message. To mark the anniversary Wednesday, Fahlman and his colleagues are starting an annual student contest for innovation in technology-assisted, person-to-person communication. The Smiley Award, sponsored by Yahoo Inc. carries a $500 cash prize. Fahlman posted the emoticon in a message to an online electronic bulletin board at 11:44 a.m. on Sept. 19, 1982, during a discussion about the limits of online humor and how to denote comments meant to be taken lightly. "I propose the following character sequence for joke markers: :-)," wrote Fahlman. "Read it sideways." The suggestion gave computer users a way to convey humor or positive feelings with a smile — or the opposite sentiments by reversing the parenthesis to form a frown. Emoticons reflect the likely original purpose of language — to enable people to express emotion, said Clifford Nass, a professor of communications at Stanford University. The emotion behind a written sentence may be hard to discern because emotion is often conveyed through tone of voice, he said. Stansifer said the emoticon was part of a natural progression in communication. "I don't think the smiley face was the beginning and the end," he said. "All people at all times take advantage of whatever means of communication they have." OK, so my only question is: who on earth was writing posts on message boards in 1982?! Who knew that they even existed back then? Pretty amazing stuff, folks. Anyhow, new podcast coming soon, and lots of exciting posts coming up now that fall is well on it's way! Summer is officially ending, and that means lots of new gadgets, tv shows and other great stuff coming up for the holidays! Remember, to email me your questions, or even video questions for a chance to be featured in a future podcast, email me at geek.girl@earthlink.net.